compiled by Gary Schajer, Vancouver, Canada. 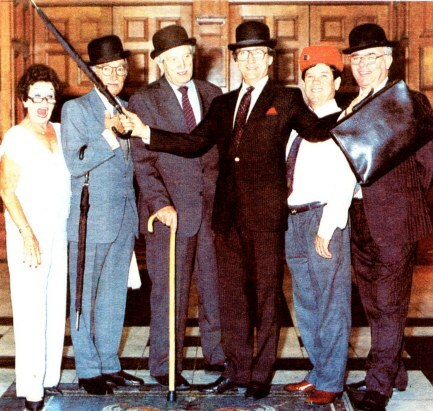 This parody of the British Civil Service was popular with both domestic and international audiences. Thirteen series of radio programs totalling 147 episodes were broadcast in the UK by the BBC from 1962 to 1977. 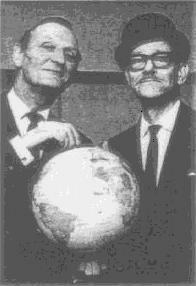 Most episodes were also transmitted internationally by the World Service. A further series of 14 episodes was produced for the the BBC Transcription Service, but not broadcast in the UK. 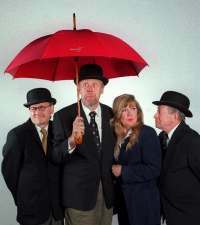 The stereotypical image of haughty Government officials, complete with pin-stripe suits, bowler hats and umbrellas provides the basis for this comedy series. On the surface, these Establishment figures are all-knowing and confident. However, behind the scenes, they are revealed to be all-too-human. They are selfish and are incompetent almost without limit. Yet the parody is done with a light touch, and the unlikely heroes of the stories are always warm and likeable. The storyline of The Men From The Ministry is centred on the General Assistance Department of an unnamed Government ministry in Whitehall. The function of this department, to assist any other Government department that is overloaded, gives ample opportunity for a wide range of hilarious excapades. The main staff in the department comprises the senior executive, code-named "One", the junior executive, code-named "Two", and their faithful secretary and tea provider, Mildred Murfin. Their domineering and philandering boss, the Under-Secretary Sir Gregory Pitkin, is the main villain of the stories, and is as grandly inept as the others. 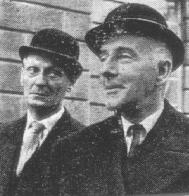 In the first two series (1962-65), "One" (Roland Hamilton-Jones) was played by Wilfrid Hyde White, and Sir Gregory Pitkin by Roy Dotrice. In the subsequent series (1966 onwards), Deryck Guyler played "One" (Deryck Lennox-Brown), and Ronald Baddiley played Sir Gregory Pitkin. Throughout all series, "Two" (Richard Lamb) was played by Richard Murdoch, and secretary Mildred Murfin by Norma Ronald. In addition to his script contributions, John Graham played many of the supporting characters. Over the years, several distinguished actors made guest appearances, including Clive Dunn, Patricia Hayes, June Whitfield and Kenneth Horne. The scripts for The Men From The Ministry were written by Edward Taylor (1), variously in collaboration with John Graham, Johnnie Mortimer and Brian Cooke. Edward Taylor (2) produced all the episodes. The final Transcription Service series was reworked by Edward Taylor, mostly from the early Wilfrid Hyde White episodes. The success of The Men From The Ministry extends beyond the BBC programmes. Over 900 episodes were produced and broadcast by Springbok Radio and Radio South Africa from the late 60s to the late 90s. These shows featured the same main characters as the BBC episodes, but played by local actors. Some early shows were remakes of BBC episodes, but most were locally written original stories. Further international adaptations of The Men From The Ministry were produced first in Sweden, then Denmark, and most notably by Radio YLE in Finland. Knalli ja sateenvarjo ("Bowler and Brolly") continues to be a popular Finnish language programme with a loyal and appreciative domestic audience. The premise of bowler-hatted twittery within the conservative confines of the British Civil Service is evidently a popular one beyond the English-speaking world. The Finnish version now exceeds the original BBC series both in terms of longevity and number of episodes produced. Most of the Finnish episodes are adapted from the BBC stories, but since 2000, they have been produced from new scripts specially written for YLE by Edward Taylor (3). In a personal reminiscence broadcast on BBC7, Edward Taylor recalled the making of the BBC series of The Men From The Ministry and its subsequent adaptation for international audiences. 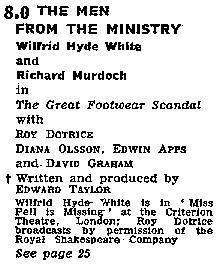 The broadcast schedule gives details of the original thirteen series of BBC episodes of The Men From The Ministry, plus an additional series remade from some of the earlier episodes for the BBC Transcription Service. The titles are those printed in the Radio Times. The Radio Times also gave short introductions to a few of the episodes. In addition, the Radio Times occasonally printed several photos featuring The Men From The Ministry characters, and articles about their antics. In the broadcast schedule, the links to the individual series give transcripts of the opening and closing announcements of most of the episodes. These can be helpful for the identification of undated recordings. For convenience, an alphabetical list of third sentences of the opening announcements is also provided. The transcripts and third sentence list are incomplete because some recordings are truncated or missing from this collection. The author would appreciate being informed of any errors or additions, or the availability of recordings of non-listed episodes. Since the original broadcasts of The Men From The Ministry, there have been occasional nostalgic rebroadcasts of various episodes on the World Service and on Radio 2. In recent years, BBC7 and BBC Radio 4 Extra have rebroadcast extensive selections of episodes, see the rebroadcast schedule and programme descriptions for details. Tapes of the episodes marked * were produced by the BBC (ZBBC 1338 in 1992, and ZBBC 1720 in 1995). Since 2006, these professional quality recordings have been available for purchase in download format. Amateur MP3 recordings of several episodes can be obtained from various web sites, for example, Radio Echoes and My Old Radio or by Torrent. (Be careful of Torrent sites that require a registration payment, many of these are fraudulent.) Additional amateur recordings are available (sometimes for a fee) from specialist web sites for radio programme collectors. by answering these 20 questions. Click the bowler hat to start. Laughterlog gives detailed information about several British comedy programmes, including an excellent article by Mark McKay about The Men From The Ministry. The British Comedy Website also provides information about a wide range of British comedy programmes. Both sites describe the history of many shows, both familiar and unfamiliar, and gives extensive details of broadcast schedules and cast members. The Global British Comedy Collaborative gives further information and broadcast schedules. Almost all recordings of The Men From The Ministry and other similar programmes that circulate among collectors were originally made by amateur enthusiasts who recorded them off-air. The available equipment was often primative by modern standards, and the resulting recordings were less than ideal. These recordings have deteriorated further with age and with repeated copying, and their defects can seriously detract from the listening experience. A process called Audio Restoration can significant improve poor recordings and make them more pleasant to listen to. This article, which originally appeared in Navy Days, published by The Navy Lark Appreciation Society, describes how modern computing power allows ordinary collectors to do very effective audio restoration work. The information in this and subsequent pages is compiled from program details given in the Radio Times and in London Calling, from the broadcast schedules prepared by Stephen Shaw, from issues 26 and 27 of Tune Into Yesterday, and from the book Radio Comedy 1938-1968 by Andy Forster and Steve Furst. Details of the South African and Finnish programmes are compiled from information provided by Robin Davis and Simo Sj�blom. Further research assistance was kindly given by Colin Bleads, Bruno Helenius, Ari Liekola, Mark McKay, Stephen Shaw, Fred Vintner, Ken Yesson and Christy Zlatos. The contributions from all these sources are appreciatively acknowledged. This site is dedicated to those anonymous early enthusiasts who recorded the original broadcasts of The Men From The Ministry and from whom most of our present recordings derive. Without them, the many people who enjoy listening to classic radio programmes would have access to only a tiny fraction of the rich resource of recorded material that is now available.